Students use markers and coloured pencils to explore how multiples of two different numbers make patterns on a number grid. Work with 2 multiples, for example multiples of 3 and 4. 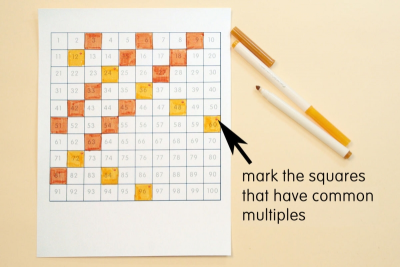 Mark the squares that have common multiples, for example, common multiples of 3 and 4 are 12, 24, 36, 48, 60, 72, 84 and 96. 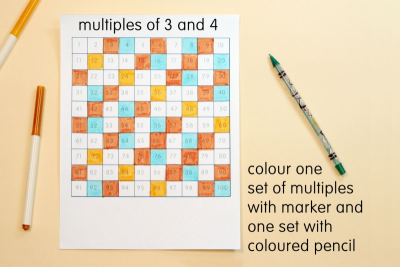 Colour the common multiples squares a different colour than the other squares for multiples of 3 and 4. Colour one set of multiples with marker. Colour the other set with a contrasting colour of coloured pencil. 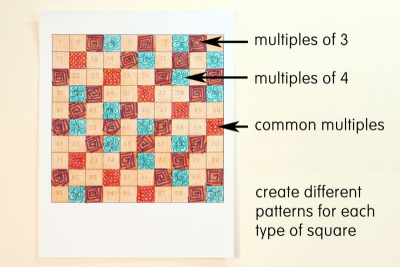 Create a different pattern for each of the 3 types of squares. 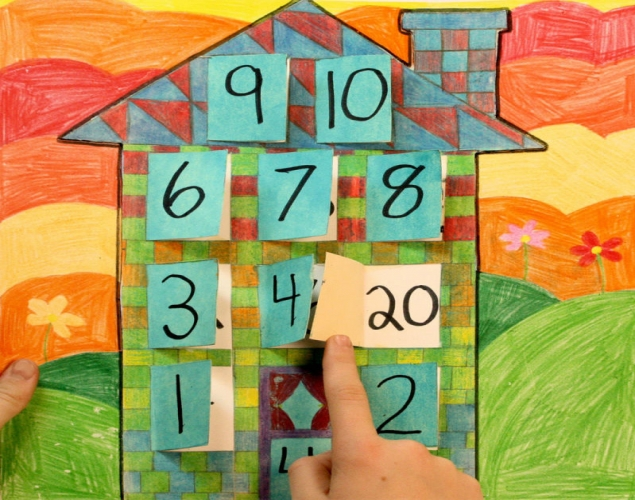 Use contrasting colours of marker to draw the pattern on top of the coloured squares. Use a coloured pencil to lightly fill in the background squares with one colour. explain how common multiples affect the design. explain how and why the pattern is the same or different. Prior to this lesson you may want to have students explore pattern using the Patterns worksheet available on this website. Download and display the Contrast and Repetition posters available on this website. Teach or review concepts about contrast and pattern. Teach or review the multiples, common multiples and integers. View the Contrast poster and discuss how to create contrast using colour and pattern. Have students identify what a multiple is and how to get them. - integers are like whole numbers but they include zero and can be positive or negative, for example, -5, -4, -3, -2, -1, 0, +1, +2, +3, etc. - "It shows the multiples of fours." Use colour and pattern to create contrast. - talk about what they learned about multiples by viewing the designs.